Scannell: I want to finish my career with you! Damian Scannell has told Eastleigh: I want to finish my career with you! Scannell will start training with his new club Southend on Thursday after signing off his Eastleigh career at the weekend against Eastbourne. He bowed out by picking up the man-of-the-match award - and a promise that he will be back at the Silverlake before his playing days are over. "I'm sure this is not the end of the story for me with Eastleigh," he said. "When I'm 35, I want this to be the last club I come to. "I've enjoyed it here and I appreciate all the support the fans have given me. "From the day Ian Baird arrived here as manager he told me there was no point having me here if I couldn't go out and express myself and that's what I've tried to do. "Playing for Eastleigh has been a good shop window for me, but I've not looked at it like that. Today’s visit of Eastbourne Borough was all about one man – Damian Scannell who made his last ever appearance for the Spitfires. The script was written for Damian Scannell to go out with a bang in his farewell performance for Eastleigh ahead of his switch to Southend United upon the opening of the January transfer window. Scannell, who has electrified the crowds week in out for the Spitfires to earn himself a big move to the Football League, did just that for one last time at the Silverlake Stadium but couldn’t stop Eastbourne Borough from remaining the only unbeaten side in the Blue Square South. Ian Baird was forced into making a handful of changes to the side who drew 1-1 with Basingstoke on Boxing Day. Scannell to miss his own farewell game? Friday 28th December 2007 - Scannell to miss his own farewell game? 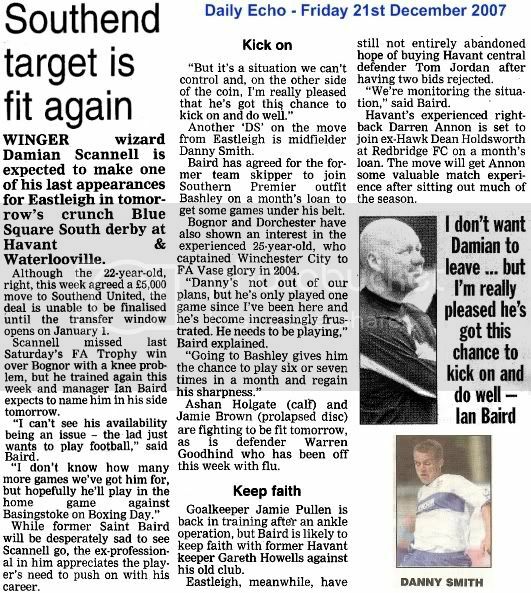 EASTLEIGH fans may have already seen the last of wing wizard Damian Scannell in action. Scannell was due to play his final game in Eastleigh colours tomorrow before his big £5,000 move to League Two club Southend when the January transfer window opens next Tuesday. But Spitfires manager Ian Baird lists the 22 year-old as a doubt for tomorrow's visit of second-placed Eastbourne Borough. Scannell played on after suffering a first-half knee injury in the Boxing Day draw against Basingstoke Town before eventually being withdrawn in the 65 minute. Baird said: "I would imagine that Damian will struggle to make the game because he has taken some quite rough treatment against Basingstoke. "He had to come off with 25 minutes to go after taking a knock to the knee. A bumper Boxing Day crowd of 879 watched on as Eastleigh came up against neighbours Basingstoke Town. Francis Vines’ high-flyers enjoying a great run sitting proudly fourth from the top in the Blue Square South. The Spitfires meanwhile were somewhat dejected having gone into this game with a single goal defeat over local rivals Havant and Waterlooville at the weekend. Paul Sales made a welcome return from injury and marked the occasion with the opening goal nineteen minutes into the game. Gareth Howells stood in for the injured James Pullen whilst Peter Adeniyi dropped to the bench. Last season Eastleigh won the same fixture by a goal to nil at the Camrose under the then manager Jason Dodd - Andy Forbes giving the Spitfires an excellent Christmas present with a crucial three points that went along way to keeping us in the division. - Scannell thanks "perfect Eastleigh"
Today’s local derby, the start of a congested fixture schedule over the Christmas season, saw Eastleigh falter in search of securing their first ever win against the Hawks. Ian Baird on his return to Westleigh Park for the first time since leaving to take charge of Eastleigh in October, made three changes to his starting eleven from the side who pipped Bognor Regis Town to a place in the 2nd Round of the FA Trophy. James Pullen was fit enough to make a comeback following an ankle operation that had kept the goalkeeper out for a month. Former Hawk, Luke Byles replaced Karim El-Salahi and Damian Scannell, amid his pending move to the football league with Southend United, shook off a knee injury to take the place of Ashan Holgate in attack. Another 'DS' on the move is midfielder Danny Smith. Baird has agreed for the former team skipper to join Southern Premier outfit Bashley on a month's loan to get some games under his belt. Bognor and Dorchester have also shown an interest in the experienced 25-year-old, who captained Winchester City to FA Vase glory in 2004. Danny's not out of our plans, but he's only played one game since I've been here and he's become increasingly frustrated. He needs to be playing," explained Baird. Going to Bashley gives him the chance to play six or seven games in a month and regain his sharpness." EASTLEIGH are advising sought-after wideman Damian Scannell not to jump feet first into a hasty move into the Football League. The 22-year-old wing wizard was the subject of a £5,000 bid from Coca-Cola League One promotion hopefuls Southend United on Friday night and Eastleigh were yesterday expected to give the Shrimpers the go-ahead to speak to him. But, with several other clubs - Nottingham Forest included - interested in the Croydon-based crowd-pleaser, Spitfires' director of football David Malone is advising him to bide his time. He said: "We've only had one definite offer for Damian faxed from Southend, but we've had several clubs express an interest in him at a price. After watching his side scrape past Bognor Regis Town 1-0 at the Silverlake Stadium on Saturday to take their place in today's second round draw, manager Ian Baird revealed that Coca-Cola League One promotion hopefuls Southend United had tabled a £5,000 bid for the talented wideman on Friday night. Under the terms of Scannell's contract following his move from Fisher Athletic last summer, if any club comes in with an offer of £5,000 or more he is free to go. A clutch of other Football League clubs, including Nottingham Forest, Leeds United and Leyton Orient, have also been keeping tabs on the talented 22-year-old, whose pace and trickery earned him trials with Millwall and Watford during his Fisher days. While the Spitfires were squeezing past Bognor Regis 1-0 on Saturday to reach the last 32 for the first time in their history, Crawley booked their passage through with a single-goal victory over Bromley. The Sussex side are currently 16th in the Conference national having had six points deducted for financial irregularities. Crawley manager Steve Evans was pleased with another home draw and paid respect to Eastleigh. Evans said: “I have had the opportunity of watching Eastleigh this season when I went to watch an opposition player against them and I thought they were an excellent outfit. Eastleigh edge FA Trophy encounter to make club history - again! In the bitterly cold temperatures in this FA Carlsberg Trophy 1st Round cup-tie, it was Eastleigh who progressed against the Rocks in front of just 318 who had braved the winter weather. There were four changes to the side who drew with Thurrock on Tuesday night. Gareth Howells replaced Ross Kitteridge in goal for his home debut. Ashan Holgate and Matt Hann both came into the starting line up to replace the injured Damian Scannell who it is thought could be out until the new year with a knee injury and Chris Piper who was out with flu. Karim El-Salahi meanwhile came into the centre of defence for Luke Byles, who only made the substitutes bench. A gesture of goodwill from the Eastleigh board of Directors saw a bumper crowd of 958 make the most of the free entry on this 'taster day' at the Silverlake Stadium, but in the extremely cold temperatures neither side could find a goal despite end to end entertainment. 6ft 4” midfielder Peter Adeniyi, Eastleigh’s latest signing coming from Bromley came straight in for his debut and put in a solid performance. Luke Byles returned from suspension having missed the 2-1 away win over Bromley at the weekend, to come in for defender Karim El-Salahi, whilst Ashan Holgate dropped to the bench. Eastleigh had two half-chances very early on but it was the visitors Thurrock who had made the brighter start, coming extremely close twice inside the opening six minutes. Eastleigh got a bit of a jolt this week during an official ground-grading visit. Unbeknown to them, they will be unable to take part in the end-of season play-offs unless they get another 150 seats installed at the Silverlake Stadium by the end of March. Although the Blue Square South title may be beyond Eastleigh this season with Lewes currently running away at the top, the play-offs are a realistic target for Ian Baird's men. The Spitfires, however, had been under the impression that if they achieved their goal of promotion to the Conference National (Blue Square Premier), they would have a season's grace to get seating up to the required 500. "We will do the work, there's not a question about that, but we'd planned to do 150 extra seats," said director of football David Malone. "Now it looks as if we'll have to do 150 first and do the rest later. Aldershot Town midfielder Lewis Chalmers has topped the fans poll to be the Blue Square Premier “Player of the Month” for November. Chalmers beat four rivals to the title after a month in which he was a key figure in his sides climb to the top of the Blue Square Premier table. The former Altrincham star has also figured in the England non-league set up under Paul Fairclough. The award in the Blue Square North goes to Eric Graves of Hucknall Town. Graves had been on loan from Gainsborough (and had even returned to his former club before the end of the month). Luckily for Hucknall, Graves signed a permanent deal to return to Watnall Road (only days after leaving) and has now become a regular feature in the side. During the month he was an ever present in Hucknall’s four Blue Square North games, scoring two goals from midfield. Eastleigh 2nd XI 0-0 Hayes and Yeading United Res. TEAM: Andy Wynn, Jack Burgoyne, Adam Shepherd, Justin Hall, Tom Roberts (c), Joe Sheppard, Adam Wiltshire, James Screen, Richard Bridle, Tom Price, Scott Waters. SUBS: Johnathan Pearce (on for Wynn 30), Callum Stanley (on for Bridle 60), Aidan Sainsbury (on for Price 77) - Unused: Niall Bryant. Eastleigh's second string were left cursing their luck on a miserable afternoon at the Silverlake Stadium. On the back of an excellent 2-0 away win in the league to Hillingdon Borough, a result which saw Brian and Adie's men up to fourth in the table, the Spitfires youngsters were extremely unlucky today up against Hayes and Yeading United with a complete lack of fortune in front of goal. This, the only thing denying them a further win. In a match played in atrocious weather conditions with a howling wind and intermittent rain showers, both sides produced some good football to give the crowd of 457 a fine afternoon's football entertainment. At sometimes an ill-tempered affair, with both sides using the flanks there were chances at either end throughout the match. With Luke Byles missing through suspension, Karim El Salahi returned to the side with Adam Everitt also returning after his one match ban. Eastleigh v Thurrock - FREE ADMISSION FOR ALL! "The Board of Eastleigh Football Club wishes all of our supporters the compliments of the season, and as a gesture of goodwill, admission to the above game will be FREE to all spectators. Goals from Andy Harris, Chris Mason 2, and Aaron Milburn saw a young Eastleigh side containing only Gareth Howells, Danny Smith, Andy Harris and Adam Roberts from the first team squad, through to the next round of the Hampshire Senior Cup. Cambridge United boss Jimmy Quinn has won the Blue Square Premier “Manager of the Month” award for November. Quinn’s team achieved a 100% record for the month including notable victories away at Torquay and Burton. Cambridge also progressed to the second round of the FA Cup, by beating current Blue Square Premier leaders Aldershot. The award is judged by a panel of experts including Setanta Blue Square Premier pundit Paul Parker. Parker had this to say about Quinn: “When you look at the teams that Cambridge faced during the month you can see the scale of Jimmy’s achievement, and they have maintained their unbeaten home record along the way”. Blue Square South manager of the month for November, Lee Paterson’s Braintree Town came to the Silverlake Stadium in excellent form with a run of five straight victories behind them but could not continue in the same vein against a resilient Eastleigh side. Back into the squad for today’s game following last weekend’s 4-2 win over Weston-Super-Mare in the FA Trophy, came Andy Harris who was back from injury and skippered at right back. Fitzroy Simpson the star performer in that game, maintained his place in the starting eleven this time though at left back to replace the suspended Adam Everitt. EASTLEIGH have had an offer rejected for Havant & Waterlooville skipper and central defender Tom Jordan, writes WENDY GEE. Director of football David Malone confirmed the Spitfires had made "quite a substantial offer" to their Blue Square South rivals, but it was turned down by his opposite number Derek Pope at Westleigh Park. Given that Eastleigh have already wooed away the Hawks' manager Ian Baird this season, Malone was not surprised by the Hawks' response. "If I was in their position I would probably have done the same," he admitted. "For one thing Tom is a decent player and, for another, I doubt they would want to do anything to help Eastleigh. "Popey's actual response to me was that Tom Jordan is not for sale, but they'd consider a straight swap for Andy Forbes and Luke Byles!" THE injury news just keeps getting grimmer for Blue Square South outfit Eastleigh. The latest bombshell dropped on Ian Baird's side is that frontman Steve Watts has been ruled out for the rest of the season with knee damage. It's been one problem after another for the former Leyton Orient striker. Having had a lengthy spell out following a cartilage operation in August, he had to have a cyst removed from behind the same knee. He marked his comeback by going on as a substitute and scoring against Forest Green Rovers in the FA Cup late last month but has been struggling on the sidelines ever since. "No one's been able to diagnose what's wrong with the knee, but it turns out I've got a hole in it and I've got to have microfracture surgery in two weeks' time," he revealed. Such surgery helps restore knee cartilage by creating tiny fractures in the adjacent bones, causing new cartilage to develop. Can definitely beat Bognor, if we do I believe that will be the 1st time in history we've got to the last 32 of the Trophy. A depleted Eastleigh squad owing to several injuries, saw the Spitfires put in a strong performance to earn their third victory over the Seagulls this season and with it, a place in the next round of the FA Trophy. 17-year old goalkeeper Ross Kitteridge, who is on loan/work experience from Reading - was the man between the sticks today for his Eastleigh debut following James Pullen’s midweek ankle operation. Meanwhile, Danny Smith came into the centre of defence as skipper, Fitzroy Simpson made his home debut starring in the centre of midfield alongside the equally brilliant Jamie Brown (back from suspension), who replaced David Hughes. A bright start from the hosts saw Matt Hann extremely lively early on down the right, whilst Damian Scannell was at his best also with excellent running, skill and hold up play in attack.